BBC Radio 1 has announced the new artists joining the station for its Residency series in 2017, with Deadmau5, Eats Everything, Helena Hauff, Jessy Lanza and Metrik all added to the team. Radio 1’s Residency incorporates two shows on a Thursday night, the first from 10pm to midnight, and the second midnight through until 1am, with Kölsch, Will Atkinson and Logan Sama continuing to form a part of the line-up. The introduction of the new artists marks the end of Steve Angello, Oliver Heldens, Heidi, George FitzGerald and Louisahhh’s regular slot on BBC Radio 1’s Residency. BUKU Music + Art Project 2017 has dropped its first wave of artists, which includes Deadmau5 and Zeds Dead. The festival will be held in New Orleans at Mardi Gras World on Friday 10th and Saturday 11th March 2017. Deadmau5 and Zeds Dead will be joined by Tycho, Jauz, Nina Kraviz, REZZ and Malaa, among others. The event will also host four thrilling b2b sets consisting of Ghastly b2b Herobust, Minnesota b2b Space Jesus, Musa b2b Otto and Shiba San b2b Justin Jay. Deadmau5 promised to release a 20-strong collection of old and new tracks via iTunes following the release of his new full-length 'W:/2016ALBUM/' last week (2nd December). Now the mau5trap boss has revealed further details of the material in a Twitter post, which stated it will “hopefully” be released in February 2017 and will feature remastered tracks dating from 1998 to 2007. You can see the full post below. Deadmau5 is set to stream live performances of tracks from his new album 'W:/2016ALBUM/' tonight ahead of its release tomorrow (2nd December). Joel Zimmerman will go live via his YouTube channel at 10pm ET/7pm PT (that's 3am for UK residents). Along with tracks from the album, his “Live In Rehearsals" session will also showcase his new Cube 2.1 stage design, as teased by the mau5 in a recent Instagram clip. Deadmau5 has promised to release a 20-strong collection of old and new tracks via iTunes following the release of his new full-length 'W:/2016ALBUM/' this Friday (2nd December). The Canadian producer, otherwise known as Joel Zimmerman, announced the forthcoming "remastered" music during an eight-hour live stream with fans. Deadmau5's new full-length 'W:/2016ALBUM' drops this Friday (2nd December), and just when you thought the anticipation couldn't get anymore intense, the Canadian has only gone and dropped a album minimix. The clip is built mainly of sublime progressive house (as is to be expected from the mau5), such as the already previewed 'Let Go feat. Grabbitz', but also features some grittier tracks and a slower-paced, trip-hop-esque closer. Check out the minimix in full below. 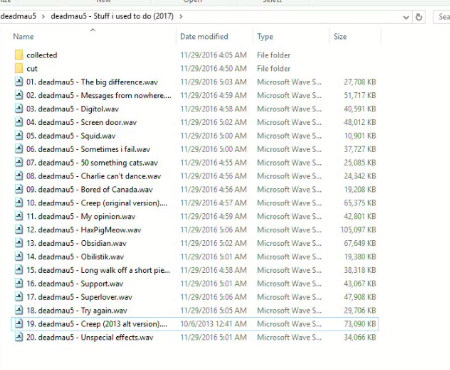 Deadmau5's new album may only be just over a week away, but that's not going to stop the Canadian superstar from sharing some even fresher material (especially considering he apparently hates his upcoming 'W:/2016ALBUM/' LP). In a rare, but not unheard of, move, Joel Zimmerman has been on a hip-hop tip, cooking up the crunchy, street-ready 'Okay' with Manchester rapper Shotty Horroh. Minus Zero Festival, the multi-day winter sports and music festival, returns to the Stratton Mountain Resort in Vermont for its second year, running from Friday 7th April and Saturday 8th April 2017. Originally known as 'Blood For The Bloodgoat', the track is a slice of absorbing, emotive progressive house featuring American EDM act Grabbitz. 'W:/2016ALBUM/' is out 2nd December. Pre-order here and check out the clip below. Deadmau5 has announced that he will host an online electronic music production tutorial through MasterClass, a company that boasts Usher and Werner Herzog as instructors. The course is said to offer an “unabashed and unfiltered lesson” into how Deadmau5, real name Joel Zimmerman, makes his powerful sound, as well as an insight into his approaches to making melodies, mixing and mastering.